The weather improved today, while still cool (mid 60s) it was sunny. The Oak Court Cats were on the back steps this morning, warming themselves. Missey prefers to take a nap in the morning sun stretched out on my desk. today, she ventured out to take advantage of the sun’s warmth on the concrete steps. They had been there for a half an hour when the first visitor came up the walk. The squirrels. Missey was asleep and didn’t notice the gray squirrel that walked right by her and up the steps. The big cat, sitting in the old planter by the door just watched and the predator was more interested in a dragon fly than the squirrel. 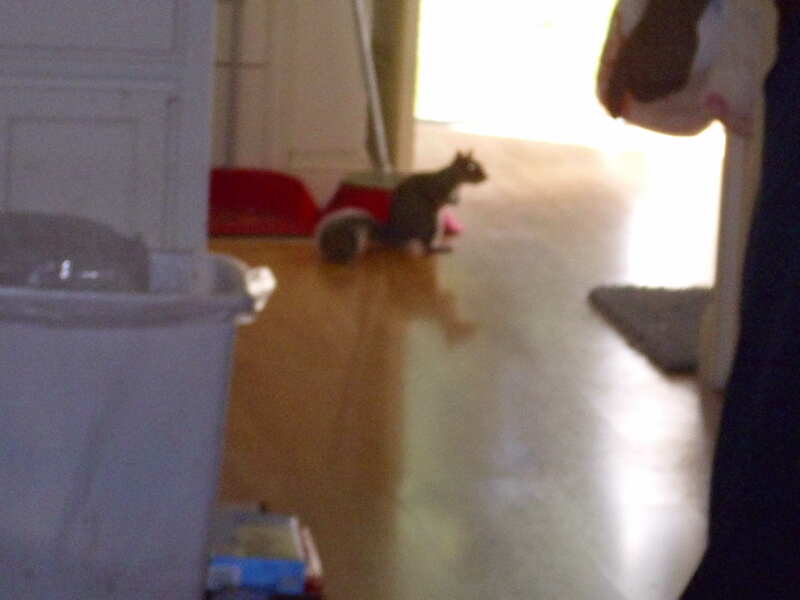 The picture is a little blurry, I was at the other end of the house when I noticed the squirrel looking around the kitchen. They know the peanuts are in a special container (I keep them in an old Folgers plastic coffee can). She was looking for the can. We may have brought this on ourselves; the squirrels come by in the morning for a few peanuts. At first they’d approach the house slowly, wary of the cats. Now, however, they come up to door and beyond. It would seem the cats have figured out the gray furballs are no threat and and because they people feed them, they must be ok and are not to be attacked. So they walk right by the cats. I’ve seen other cats putting up with them; our first cat, a mellow Manx, was born in a house that had a squirrel in residence and he must have thought they were part of the pride. When Missey was much younger, she used to chase them from the yard; now, however, she only chases the other cats away from her nap spot. We have a dozen furry visitors now, the oldest being a chubby female (the alpha from the way she acts) all the way down to 2 small young ones (who haven’t figured out the cats yet). There is an old guy, looks like he’s been through a few fights (torn ear, right foreleg looks like it was damaged and didn’t heal right). While most are California gray squirrels, there are a few brown and one who is almost black. A diverse group who make their homes in the trees just outside of the yard. The cats have accepted the visitors, probably until one of them touches the cat food. Things could change then.